Eone The Bradley makes everyone have the equality to enjoy ‘time’. Eone The Bradley has no hour hand, the minute hand, and the second hand. They are replaced by two steel balls that move along with time. 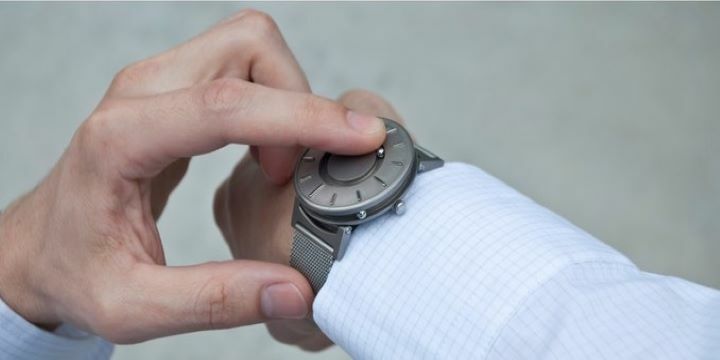 Even if the steel balls are not in the right positions that indicate the time, simply shake the wrist and they will return to their original position by the magnetic force. There is no magnifying glass on the surface of the watch, so the user can touch the parts of the watch and "see" the time by their hand. Hence, it is called a timepiece, not a watch. Its unique design, coupled with the sense of touch technology. It redefined the way how time is expressed. It also changed the way that we interact with watches anti-traditionally. The Bradley is not only the international award-winning design but also listed as a permanent collection by the British Museum.